Ivoriona, under jockey Luis Vivanco, winning the $94,700 Lone Star Speedhorse Paint & Appaloosa Futurity(G1) on October 29, 2016. FORT WORTH, TX�JANUARY 5, 2016�The 2016 racing season was one for the record books, as colorful Paints dashed to the finish line with their tenacious jockeys aboard. It takes a village to raise a champion running horse, though, and APHA�s racing program makes sure to recognize all involved. Randy Hill and Mickey Johnson's 2-year-old filly Ivoriona was named the 2016 regular registry World Champion, Champion 2-Year-Old and Champion 2-Year-Old Filly. Mickey and Stanley Johnson bred the daughter of Quarter Horse sire IIVORY JAMES from the APHA mare Friona by Texas Hero. Randy Hill trained the filly to a (7) 5-0-1 record with $126,804 earned. 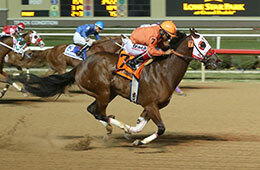 Ivoriona won the Speedhorse Graham Paint and Appaloosa Futurity(G1) at Remington Park, Lone Star Speedhorse Paint & Appaloosa Futurity(G1) at Lone Star Park and the Speedhorse Paint & Appaloosa Futurity(G1) at Fair Meadows.